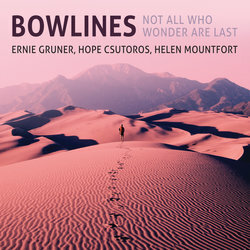 BOWLINES includes three of Australia’s leading improvising bowed string players. Ernie Gruner (violin, octave violin), Helen Mountfort (cello) & Hope Csutoros (violin, viola). “Their collective musical flights of fancy draw inspiration from sources including classical and world music”. Hope Csutoros studied at the Victorian College of the Arts and the Budapest Academy of Music in Hungary. Performances includes DeFlocked String Quartet, My Friend the Chocolate Cake, Stilleto Sisters, Circus Oz, Chamber Made Opera. Recording credits include Midnight Oil, Deborah Conway, Mark Seymour and Renee Geyer. Ernie Gruner led the Monash String Quartet, then focussed on Irish and jazz. He’s improvised for 18 years with Melbourne Playback Theatre and is Australia’s leading klezmer violinist following studies in New York, Kracow. He’s played jazz, gypsy, middle-eastern & balkan music with Jugularity, Klezmeritis, Yalla!, Bohemian Nights (7 NZ tours) and Saray Iluminado. Ernie appeared twice on TV’s “Spicks and Specks” and has over 75 recording credits. Helen Mountfort performs with Fine Blue Thread, Cosmo Cosmolino & Not Drowning Waving. She was a member of DeFlocked improvising string quartet, and David Chesworth Ensemble. She has recorded with many Australian artists including Missy Higgins, Archie Roach, Paul Kelly, Midnight Oil, Renee Geyer and Mark Seymour.